We have a solid night of fights ahead of us. UFC 216 is being headlined by two UFC title fights. In the main event, top lightweight contender Tony Ferguson takes on rising star Kevin Lee in a must-watch UFC interim title fight, and in the co-main event, flyweight champ Demetrious Johnson will attempt to break the record for the most consecutive UFC title defenses by battling Ray Borg. Apart from the two title fights, UFC 216 features a fun heavyweight showdown between former champ Fabricio Werdum and Derrick Lewis, and an important lightweight bout in Beneil Dariush vs. Evan Dunham. Where: T-Mobile Arena, Las Vegas, Nev. When: Saturday, Oct. 7. The three-fight UFC Fight Pass preliminary card begins at 6:30 p.m. ET, the four-fight FX preliminary card begins at 8 p.m. ET, and the five-fight main card begins at 10 p.m. ET on pay-per-view. 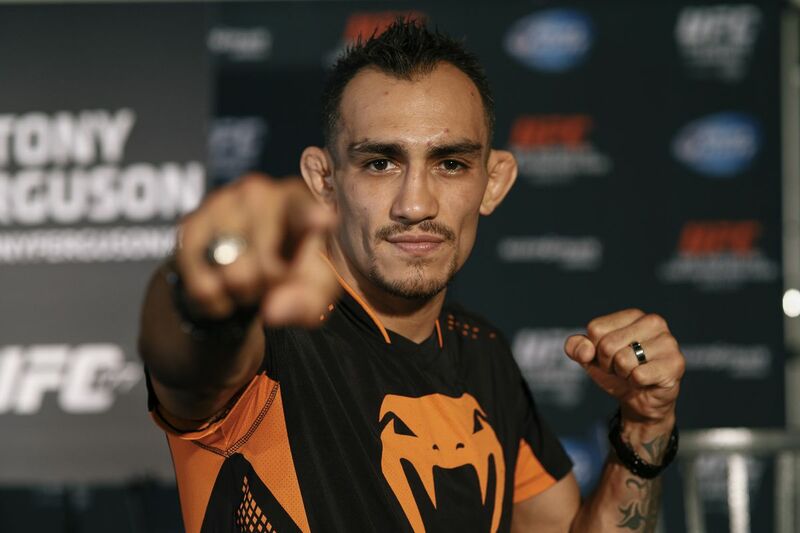 Whether you think they are fighting for a legitimate title or not, Tony Ferguson vs. Kevin Lee is one of the best lightweight bouts booked this year, and it has plenty of potential of being a fantastic fight. Ferguson has been terrorizing the UFC lightweight division for seven years, compiling a record of 12-1. His violent style is fueled by one of the most well-rounded games in MMA. Ferguson has an extremely dangerous ground game and an equally dangerous striking arsenal. Anywhere the fight goes, Ferguson has the skills needed to be a threat and put an end to the fight. Meanwhile, Lee may not have as many tools as Ferguson, but the ones he does have are very effective. Lee is a great wrestler with a very dominant and technical top game. Lee’s back takes and rear naked chokes are some of the best in the UFC. Striking wise, Lee is not much of a threat, but he can hold his own on the feet. This should be an amazing bout between two very skilled fighters, but I don’t necessarily find it a difficult one to pick. Ferguson is a way more complete fighter and we’ll likely see that in the fight. Lee’s specialty is in the grappling department, but I’m not entirely sure he’ll even have an edge in his own game. Ferguson is extremely skilled in the grappling arts, and I think he will get the better of the exchanges on the ground. And on the feet, to me, it’s pretty clear Ferguson is the better fighter. I also find Ferguson to have a better fit for five rounds. And let’s not forget, yesterday, Lee looked in rough shape at weigh-ins, which is usually not a good sign for performance. I see Lee maybe getting his way with some takedowns here and there, but ultimately I think Ferguson will get the better of the grappling and striking exchanges. I also find Ferguson’s incredible output and pace to be too much to handle for Lee over the course of five rounds. UFC flyweight champ Demetrious Johnson will get a chance to make history and become the most dominant champion in UFC history. Johnson will be taking on young contender Ray Borg in his 11th title defense. In my opinion, Johnson is the pound-for-pound king. The flyweight champ is flawless in his striking, and extremely dominant in his grappling. Johnson doesn’t really have any holes in his game – he’s excellent everywhere. On top of that, Johnson is ridiculously fast and explosive, and has the best conditioning in the UFC. Borg is an excellent fighter. The 24-year-old has the movement and athleticism of a long-time wrestler. He’s lightning quick in everything he does and very powerful as well. Borg is a complete fighter with solid striking and a dominant ground game that includes explosive, dangerous submissions. Borg has an advantage in size, and I feel his movement is very wrestling oriented, which could give Johnson issues when they engage in grappling. Yet, I don’t think that will be enough to stop “Mighty Mouse.” Johnson is just far too advanced for anyone at flyweight, and I don’t see him losing at 125 pounds anytime soon. This is a great heavyweight showdown that could have some title implications. Fabricio Werdum, a former UFC heavyweight champ, is one of the most skilled fighters of his division. Werdum has a very high-level ground game and he’s able to translate that well into MMA. The Brazilian has improved his striking significantly enough, that he can now stand and trade with almost anyone. On the other hand, Derrick Lewis is a good striker with a massive amount of power. The Houston native is not great on the ground, but he’s good at getting back to his feet when taken down. I think Werdum will have an edge almost anywhere the fight goes. Werdum is better on the ground and on the feet, he comes in better shape, and he’s way more experienced than Lewis. Werdum is not a double-leg kind of guy, and he lacks a some of wrestling, so that will improve Lewis’ chances of landing a big shot in this fight. Still, I don’t think Lewis’ chances of landing something big on Werdum are big enough to get my pick. I see a composed Werdum using straight punches to tag Lewis, while avoiding Lewis’ power. Well, here is one of the first women flyweight bouts we’ll now be seeing in the UFC. Kalindra Faria is a seasoned veteran that has faced solid competition outside the UFC. Faria is very strong for the weight class and uses that edge well in her fighting style. Faria likes to take her opponents down and ware on them with heavy top control and ground-and-pound to eventually create an opening for a submission. Mara Romero Borella is a bit different than Faria. The Italian does’t like to move forward like Faria, as she usually tends to back up a lot while looking to counter strike. Faria has some wrestling and a good ground game. She’s also pretty experienced and very accurate in her strikes. I think Faria is more battle tested than Borella, as she has faced tougher competition outside the UFC. Borella’s tendency to back up should help the bigger Faria get a hold of her and pin her against the cage where she can look for a takedown. I see Faria using her size and takedowns to get a convincing win. Here’s a solid fight involving two top-15 lightweights. Beneil Dariush is an accomplished grappler that has proven to be proficient almost everywhere in the fight game. Dariush is battle tested, has shared the Octagon with some of the very best, but still has plenty of fight left in him just being 27 years old. The Kings MMA product is a threat to anyone at 155 pounds. Dariush’s opponent, Evan Dunham, is a solid veteran that has reinvented his career. Not so long ago, Dunham was on a three-fight skid, but managed to turn that around and he’s now unbeaten in his last four UFC bouts. Dunham is a gritty grappler with very good boxing. Dunham is also very durable and experienced. I think this bout should be a lot closer than the odds say. Dariush comes in as a solid favorite, and with good reason. Yet, I see Dunham getting a win here. I think he has a lot more grit than Dariush, and I think his pressure will get him a decision win here.